President of Meisho Co., Ltd.
Meisho Co., Ltd. was established in 1947, since then more than a half of century has elapsed. Now we are being re-born as a new fresh company for 21st century. Due to tremendous development of telecommunication systems, paradigm has changed in global yet universe scale. Space tour is now no longer our dream. Under such circumstances, I wish to create business to contribute to the future of human being as our corporate Mission. We look forward, advance for future, always keep in mind of harmony with global and universe environment and aim to be an exciting company with full of happiness for work and pleasure for creation. 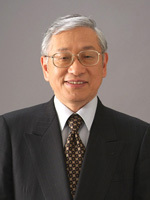 Shuji Kita, President of Meisho Co., Ltd. Copyright(C) 2000-2017 MEISHO CO.,LTD. All Rights Reserved.